Nestled along the tranquil waters of a private, protected beach, this is where luxury mingles with style. With 1,264 guest rooms, lavish white sands and stunning tropical views ideal for every guest, this is better than a beach – it’s your fantasy playground. Enjoy stellar all-inclusive amenities with 9 world-class restaurants, 9 bars and lounges, championship golf, and 6 sprawling pools. Kids will love the Little Big Club, splash parks, and live shows while the headliners in your crew enjoy exclusive amenities reserved for adult guests. Set along the coast of the Riviera Maya, Mexico. 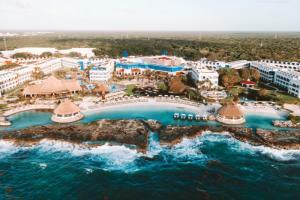 Approximately 48 miles from Cancun International Airport.